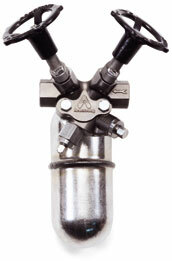 Armstrong's Steam Distribution and Condensate Collection Manifolds simplify your tracing applications. That's because they bring all the components - steam traps, steam tracing manifolds, valves - together to reduce installation costs and provide a compact, easily accessible assembly that is centrally located. As steam distribution assemblies (MSD/SMSD), manifolds place all steam supply valves in one location. Standardizing components and centralizing their location simplify installation while reducing costs. You also save because routine maintenance is faster. Insulation can also be provided . . . and can bring major savings in most installations. 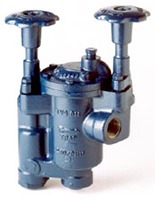 Armstrong combines its Trap Valve Station (TVS) with a manifold in a package called the Condensate Collection Assembly (CCA). The prepackaged assembly offers many great benefits—cost savings in assembly, design flexibility and reduced purchasing and design time. The CCA with TVS 4000 is guaranteed for three years. The Armstrong Ambient Sensing Drain Valve (ASDV) is ideal for protecting piping, valves, fittings, pumps, condensate systems, safety showers, fire lines, spray nozzles and freeze-sensitive equipment. It also can be used to provide back-up protection on steam-traced systems or equipment. The Armstrong Condensate Sensing Drain Valve (CSDV) is an automatic valve with a thermostatic wax-filled capsule. The valve is designed for winterization of steam tracing, instrument tracing, condensate return line freeze protection or other processes requiring protection under 150°F (65°C). Armstrong Thermostatic Isolation Valves have a variety of uses. They can turn steam, air, gas or liquids on and off in response to ambient temperature change. They can also automate steam-tracing lines and pneumatically controlled pumps for injecting anti-freeze liquids and control water line freeze protection. Other jobs for these versatile valves are to control heated drum heater enclosures, plate or panel clad tanks, unit heaters, and similar equipment. Reverse-acting models automate cooling sprinklers and cooling baths. Armstrong automatic differential condensate controllers (DC) are designed to function on applications where condensate must be lifted from a drain point or in gravity drainage applications where increased velocity will aid in condensate drainage. When lifting from the drain point, often referred to as siphon drainage, the reduction in pressure that occurs when the condensate is elevated causes a portion of it to flash back into steam. Ordinary steam traps, unable to differentiate between flash steam and live steam, close and impede drainage. Increased velocity with gravity drainage will aid in drawing the condensate and air to the DC. This increased velocity is caused by an internal bypass, controlled by a manual metering valve, so the condensate controller will automatically vent the bypass or secondary steam. This steam is then directed to the condensate return line or collected for use in other heat exchangers.